Route 66. The Mother Road. The Main Street of America. Winding through eight states and clocking in at nearly 2,500 miles, it’s the epitome of the American highway: vintage neon, classic hotels, diners serving all-American fare, curio shops, and — of course — drive-by scenery that captures the country’s wide range of landscapes, from forest to prairie to desert to coast. Some of the best sights and experiences to be had on this hallowed road — or at least those sections of it that remain — are in New Mexico. In and around cities like Albuquerque, Gallup, and Tucumcari is where you’ll find these eight unforgettable stops (and yes, where you can get your kicks). About a 2.5-hour drive east from New Mexico’s central Route 66 hub in Albuquerque, be sure to pull off for a night at this pink, L-shaped hotel that was one of the inspirations for the Cozy Cone Motel in Pixar’s Cars. 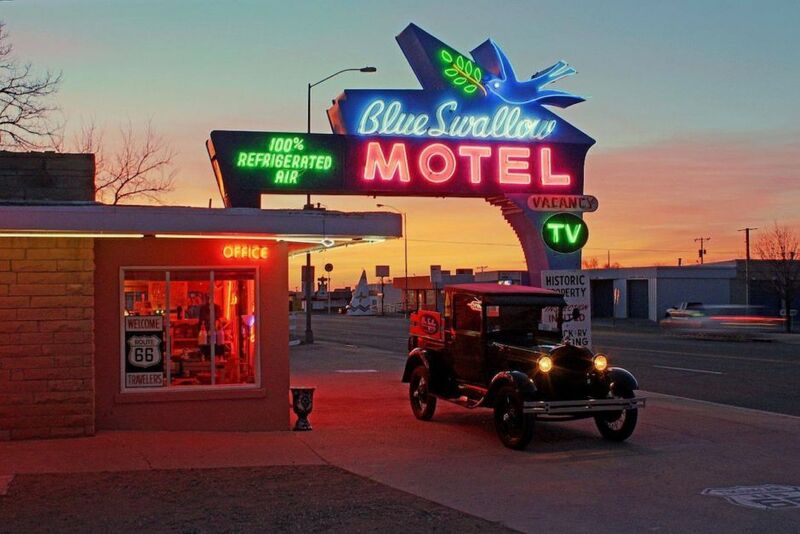 The property, located in Tucumcari, is hard to miss — its blue and pink neon sign is a real stunner, and each room comes with its own garage (so your probably-not-a-’57-Bel-Air can relax in style as well). One of the main reasons Route 66 is such a classic part of American history is the cars themselves. Timeless relics of “shiny and chrome,” these purveyors of America’s favorite highway-bound pastime can be admired at the old-style museum in the city of Santa Rosa, about an hour and 45 minutes east of Albuquerque (turn off where you see the bright yellow hot rod on a pole). The museum houses 30 different vintage cars of all styles, from street rods to racers, as well as road signs and other souvenirs from along the Mother Road. When people in Albuquerque want a good show, they go to the KiMo theater. Not only does this historic property (built in 1927) host a huge variety of acts from theater and film screenings to concerts and backstage tours, it’s simply one of the prettiest buildings in all of downtown. It’s built in the classic Art Deco-Pueblo Revival style that is so typical of New Mexico, combining Art Deco motifs with adobe architecture and indigenous symbols and detailing. Fans of the paranormal are also drawn here because of the reported hauntings. And although ghostly encounters have been “disproven” time and time again, the truth is still out there. If you go nuts for good neon, a stop at this store — owned by an industry icon — should be high on your list. Robert Randazzo has been handcrafting glowing neon signs and images since 1973, and he’s especially famous for his iconic neon masterpieces like the signs that now adorn businesses up and down Route 66. Located right on the historic route in Nob Hill, the building itself is a nondescript white block — but at night, when the windows light up with all that fiery neon? Like seeing color TV for the first time. It’s not a trip without some souvenirs to take home, and Tee Pee Curios in Tucumcari has the best around — from Route 66 wall decals to t-shirts (“New Mexico is a state, not a country!”) to baseball caps to those “grow-a-cowboy” doohickeys that you put in water and the tiny figurine puffs up. But the exterior is part of the attraction, too, with its eye-catching cactus-and-tepee neon sign and front entrance that’s in the shape of — you guessed it — a tepee. The building started as a gas station in the 1940s, but eventually found its true calling as a curio shop. The fun of stopping here isn’t just browsing and taking pictures, but also chatting with the owners. Ask a few questions and they’ll almost certainly tell you all about the shop’s history. Rounded counters with checkered black-and-white tiles and worn-in teal stools. Gleaming red and blue neon. The Route 66 insignia, a beacon on the roof luring hungry drivers from the road. This beautifully preserved example of the quintessential Route 66 diner is everything a diner should be: classic, cozy, and crowded. A Phillips mechanic shop and gas station that was converted into a restaurant in 1987 (the hydraulic lift still works! ), the 66 Diner serves items in the realm of milkshakes, burgers, and chicken-fried steak (as well as New Mexico favorites smothered in green chile), and you’re definitely encouraged to take pictures in front of the diner’s “Pile Up” and “Fender Bender” wall of Route 66 memorabilia. As the song says, you’ll eventually come upon Gallup, New Mexico, and while you’re passing through seeing the sights, you should most definitely shack up at the El Rancho Hotel. Built in 1937 by the brother of famous director D.W. Griffith, the hotel was a de facto home for Hollywood elite and film crews when they were shooting movies in the area. Its rooms have played host to the likes of Ronald Reagan, Katharine Hepburn, and John Wayne, and the hotel captures the look and feel of a Wild West hunting lodge with its cavernous lobby of dark wood and brickwork. Its white outdoor portico, which bears the phrase “Charm of yesterday…convenience of tomorrow,” and the hotel’s vibrant neon sign have made it one of the most historic — and photographed — sights on the route. Richardson’s Trading Post has been a fixture of the town of Gallup since it opened in 1913, operating as a trader with the nearby reservation and offering a huge selection of Native American treasures, most notably some incredibly beautiful rugs (their rug room houses more than 3,000 intricately woven Navajo pieces). It’s also a perfect spot to pick up jewelry — bracelets and necklaces made with New Mexico’s state gem, turquoise, are the standard souvenir items here. Grab one of these, take about a thousand photographs, and you’ll be well on your way to getting your kicks. This post is proudly produced in partnership with the New Mexico Tourism Department.